A new study from the U. S. Forest Service and two environmental groups finds that investing in forest management could shrink the size of wildfires and save California hundreds of millions of dollars. "It's a classic case of pay me now, or pay me a lot more later when the big fires occur," says David Edelson, the Sierra Nevada Project Director at The Nature Conservancy and a primary author on the report. Scientists from The Nature Conservancy, the Sierra Nevada Conservancy and the Forest Service concluded that forest management can save two to three times what it costs to fight and clean up after fires, and shrink the size and intensity of fires up to 75 percent. The report recommends two steps to manage forests: Thin the undergrowth by cutting down smaller trees so they won't be able to carry the fire up into the canopy; and conduct prescribed burns to clear the underbrush. "By having frequent low-severity fires the underbrush and small trees cleared out, and the risk of these kinds of destructive megafires was much lower," says Edelson. "Currently, we're robbing Peter to pay Paul. When there's a huge fire, we take the money away from the pots that are used to reduce wildfire risk. We are in a negative feedback loop, and we've gotta stop doing that." The biggest costs of a wildfire come from damage to homes and buildings, clean-up after the fire and the massive amount of carbon dioxide released during the fire. This chart, taken from the report, compares the cost of a fuel treatment program with the money saved by preventing large wildfires, over a 30-year period. The "low" and "high" columns reflect the range of savings. The study drew on 30 years of fire data from the Mokelumne River watershed, an area researchers said is representative of watersheds across the Sierra Nevada. Based on that history, they forecasted the rate and intensity of fires over the next 30 years under two scenarios: with forest management and without it. The current drought is drying out soils and leaving trees weakened, conditions that are conducive to megafires, say scientists. 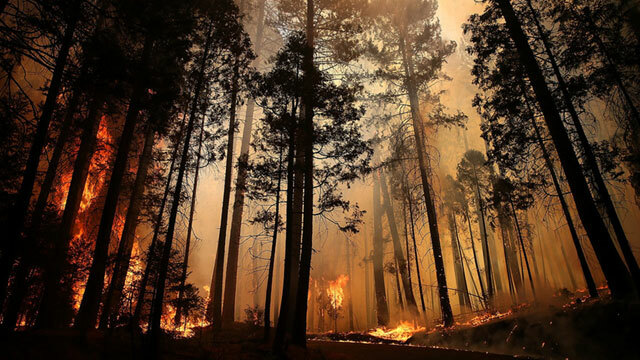 "An event such as the Rim Fire would be more likely in these drought condition years because they are more conducive to intense burning," says Phil Bowden, the Regional Fuels Program Manager for the U. S. Forest Service Pacific Southwest Region. Fire scientists say a lack of funding combined with a century of fire suppression has left a massive load of undergrowth in the state's forests. Right now, the U.S. Forest Service takes fire prevention measures on about 150,000 acres of national park land in California each year; its goal is to raise that to 500,000 acres. The issue has long been on the agenda at the national level, as well. On April 10, the Obama administration released the National Cohesive Wildland Fire Management Strategy, which focuses on fire prevention. For a quick breakdown of its recommendations, check out this Grist article by John Upton.